OWNEY –The Globe-Trotting Mail Mascot - I ran across an interesting story the other day about a little mutt dog that became the nation’s Post Office mascot from 1888 - 1897. Owney, a little mixed terrier, traveled for nine years across the nation’s railways on mail trains, always returning to Albany, PA, a key division point on the New York Central railroad system, one of the two largest railroads in the U.S. at that time. Over the years, he was given medals and citations by various organizations, as the country marveled at the little dog’s dedication to the mail service. Once, it’s said, that a mail bag fell from a delivery wagon. Owney jumped off the wagon and guarded the bag until a postal worker missed him and the mail bag and returned to find him sleeping on top of the bag, preventing anyone from touching it except a postal worker. OWNEY’S MEDALS: Over the years, post workers around the country where Owney visited, hung medals on his collar until he had accumulated hundreds of medals. It was necessary to give him a vest on which to pin the medals. He jingled like sleigh bells when he walked. Occasionally, Owney would jump on an outbound train and disappear for weeks or months until he would reappear in the Albany post office. A train trip into Canada got him into trouble once, when he was detained by the Canadians and held for ransom, demanding charges for his board. The Albany postmen pooled their money and bailed poor Owney out of Canada. He was returned once more to the Albany post office. EUROPEAN TRAVELS: It is documented that in 1895, Owney traveled via steamship and rail, riding with mail bags throughout Asia and across Europe. He was fed and tended by postal workers along the way. The Emperor of Japan awarded him several medals bearing the Japanese Coat of Arms. His triumphant return to American was covered by newspapers nationwide. He became world famous after the trip. As the years progressed, Owney’s eyesight and health failed. On orders of the local postmaster in Toledo, Ohio, they detained him (I suppose they thought for his own good) and kept him tied in a basement. The report is that he became aggressive (probably from despair at being held against his will). He allegedly attacked a postal worker and bit him. He was shot and killed on June 11, 1897. PRESERVED AND HONORED: The nation’s postal workers refused to bury their beloved mascot. They asked that the dog receive the honor of being preserved and taxidermied. His remains were sent to the Post Office Department Headquarters and eventually to the Smithsonian Museum. His remains required an extensive taxidermy makeover by 2011 when the USPS issued a stamp honoring Owney. 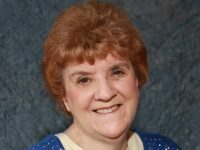 Owney has been the subject of five books. 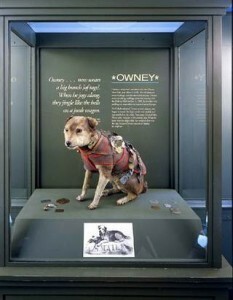 His remains now stand in a glass case in the Smithsonian Institute in the National Postal Museum atrium in Washington D.C., wearing his harness and surrounded by many of his tags. MORE INFORMATION: You can find more information about Owney in Wikipedia and other internet online resources.